Do Blockchain Business Models Imply A New Business Playbook? As more startup are springing up on Blockchain technologies, it is normal to see the proliferation of Blockchain protocols that promise to disrupt any industry. Just like when the web started to become mainstream, thanks to technologies like search engines. We saw the birth of many search engines that made the search market fragmented; up to when Google became so dominant to tame most of the search market share. Are we assisting also today to a similar phenomenon? In part. However, to understand the Blockchain Economy and the business models that will spring from it we’ll need a slightly different business playbook! Do we need a new business playbook? There is one critical point to notice. Where the internet allowed new companies to emerge. That created the rise of business models that before were not possible. One trivial example is Netflix delivery of streaming content via the internet, with a subscription-based business model. Today that model has become the standard. However, when you start thinking about how value has been created and captured in this internet era, one word comes to mind: data. When you scroll the Facebook feed, what makes it so addictive is the ability of its algorithms to tap into behavioral data of its users to give more and more “meaningful” suggestions that only make people wanting more. When you keep watching Netflix, its algorithms learn more about your tastes and preferences to create a stickier experience, that over time makes you wanting more. Those algorithms learn through data, which might be classified as interactions you have on the platform. All that data is stored and handled by massive databases, called graphs. The access to those graphs isn’t open; it’s proprietary. Indeed, that data is the main asset of those tech companies. It is what makes them monetize their business models, create unique experiences for their users and retain value in the long-run. Therefore, even though initially the internet era paved the way for hundreds of new business models. It also created a winner-take-all effect. Where those companies able to capture network effects, would eventually gain a massive competitive advantage. However, as pointed out by venture capitalist Fred Wilson, these deals were “fewer and larger.” In short, in the last years of the internet era, investors and existing players are consolidating toward larger deals that are creating more consolidation, winner-take-all effects, and high barriers to entry. It is true that as of 2019, new internet companies can be born and become the next Facebook or Google. Yet, it might not be as true as it was a decade ago. The tech players dominating the market might use their cash at the bank to buy them up. In short, the internet seemed to have produced more open business models compared to the past (initially it did). Consolidation kicked in, and new “conglomerates” have formed in the marketplace. While this process might be normal in a world where applications powered by proprietary data took over, ti might not be so in a blockchain economy, let’s see why. Here’s one way to think about the differences between the Internet and the Blockchain. The previous generation of shared protocols (TCP/IP, HTTP, SMTP, etc.) produced immeasurable amounts of value, but most of it got captured and re-aggregated on top at the applications layer, largely in the form of data (think Google, Facebook and so on). In other words, the protocols that allowed the web to work in the first place didn’t manage though to capture economic value, which instead went through applications. In a blockchain economy, the opposite happens. Applications become marginal compared to the protocols that make them work (think of Bitcoin or Ethereum). This theory has important implications, as it points out how we need to change our way to think about business. That also might imply a new business playbook! If we want to succeed as business persons in a blockchain economy (when and how it will prove to work), we need to change our playbook then. For instance, back in 1998, AOL and Yahoo represented the Internet! Most of the web traffic went through those portals. In 2018, Verizon, which had created a business unit called Oath (which comprised Yahoo and AOL acquisition) wrote them off for approximately $4.6 billion! Twenty years from now, who will still be on that list? Google made over three billion dollars in revenues and about four hundred million dollars in profits! The web wasn’t just that bubble that burst during the dot-com era. It proved to be a whole new world. Business people took notice. If a blockchain economy might prove sustainable in the long-term, understanding of how the web evolved and how tech companies became successful will be critical. However, we’ll need to look at this phenomenon with different eyes. We might want to keep our focus on those protocols that will eventually dominate the blockchain economy as value captured might subsequently be there. When the web kept growing at an exponential pace, new companies and innovative business models sprouted up. On this blog, I have spoken at length about the innovation introduced by Google Business Model and why I believe this is what made it so successful. The paradox though is that what seemed an innovative business model a few years back, it seems has become an accepted and standard business model today. Another paradox is that as those tech giants have taken it all, many business people assume that this is the way it was supposed to be. When you think about the hidden revenue generation model of Google and Facebook through advertising. This model has worked exceptionally well in the internet era, as Google and Facebook could retain the ownership of the data generated by billions of users around the world. Another business model would have been too difficult. That is also why managing this data from massive, centralized data centers makes sense. The blockchain might change that, as it allows finally to control data at the decentralized level. Each user might be able to retain the ownership of the data, while the company will make money based on its protocol. In the last few years, many new companies have been created, based on Blockchain protocols. I’m mentioning just a few use cases I’ve been following, especially in the publishing world. Bitpress is developing a framework that in a way should allow a better, bottom-up fact-checking mechanism. Will this succeed? Hard to say. There is one aspect though that I think is might be critical. In their PageRank mechanism, they want to allow publishers to express an opinion on the resources they link to. Those links can carry a vote which isn’t necessarily positive, but it can also have a negative connotation. In other words, Google‘s PageRank has also been built on the assumption that links are good votes that a site passes along another site. Just like in academia, where referencing to another author means a favorable vote. So Google‘s PageRank has used the same mechanism to rank web pages. This has opened up manipulations and drawbacks. For instance, as of today nonetheless, the sophistication of Google‘s new algorithms driven by AI, things like private blog network or PBN (a network of websites that exchange links from each other) are still a reality. Those not only might be a mechanism that still works to rank web pages. But it also requires a lot of resources from Google to catch up with those networks. In fact, as of now, besides intelligent algorithms; Google might have a militia of engineers browsing the web to find those networks and blacklist them! Would Bitpress mechanism prove successful? I got passionate about the Steem Blockchain the day I’ve read their white paper and when I started to experiments with the many apps sprouted up on this blockchain. The most exciting part of this blockchain is the way it allows its community to monetize while either curating or writing content. In short, Steemit and other Steem Blockchain apps, pay their users to do what they already do on another social network, for free. This model has still proved to be sustainable in the long run and as I explain in this article there are still some challenges. However, if this model proves effective, it might become the next big thing to take over purely centralized giants like Facebook, Reddit, and Quora. A company which most crucial asset is made of the data of its users will make sure to preserve it. However, as short-term logic might prevail by time to time, those companies will also try to profit as much as possible from that data. This places the company owning the data in the conflict of interests with its users. For how much that company is comprised of smart individuals. Conflict of interests and the way the system works might well make those companies mismanage the data. Dock.io is envisioning a decentralized way to manage professional data, which gives ownership to the users and have them choose which third parties can reuse that data. What I find most striking of the new Blockchain protocols that are getting created is that those allow the experimentation of new business models that challenge the old ones created during the web era. 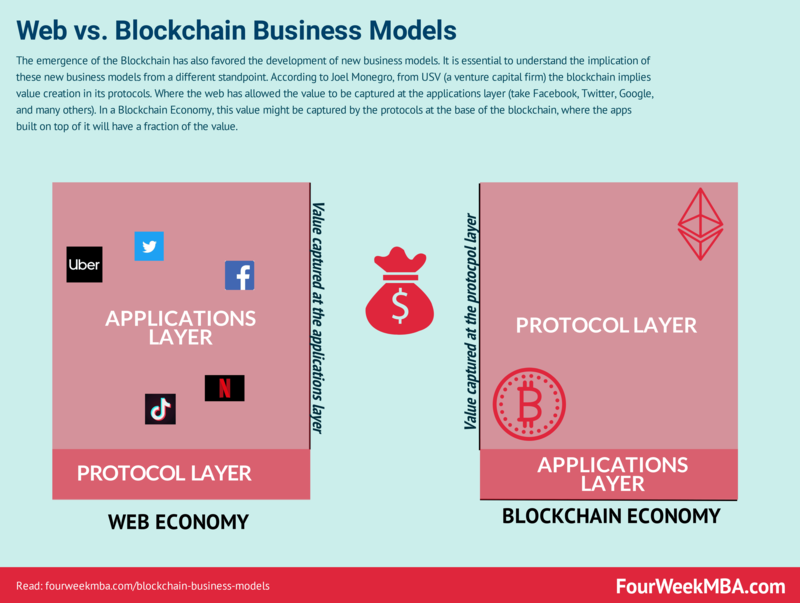 Those business models though might be skewed toward protocols, rather than apps! One thing is clear so far. The blockchain killer app is “decentralized trust.” Where tech companies have proved pretty bad in handling our data (see the Cambridge Analytica scandal). You won’t have to trust anymore a central authority, driven by business incentives with your data. You will trust a mathematically driven decentralized network. Of course, we don’t have to fall into the “utopian trap” where we think innovation is better than existing ones. The Blockchain Economy might also allow new centers of power. Also, existing tech companies (Facebook is one) are also investigating into a potential way to integrate it within their existing business models!